MADISON, Ala. (WHNT) - Who doesn't love a great love story? We shared one with you in July when Lucinda Myers and Murphy Wilson's engagement photos went viral. They were seen by millions of people around the world on Twitter, Facebook and Instagram. The Madison couple has now tied the knot. The last time we saw Murphy and Lucinda, they were strolling down the sidewalk, holding hands, on their way to matrimony. And Murphy was saying with a laugh, “I just want to get married.” The couple met at Huntsville’s First Seventh Day Adventist church. “I knew that I could never love another woman as much as I loved Antoinette,” Murphy said. “But I can love someone as much as I loved her for who they are.” His wife of 41 years had passed earlier. 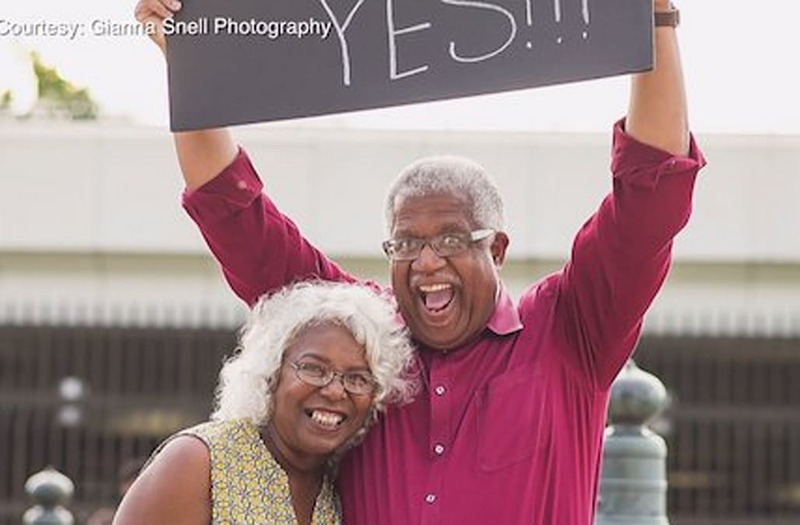 Four months later, Lucinda, who divorced more than 30-years ago, moved to Huntsville. They first noticed each other while sitting in the balcony at the church. But everyone saw the kiss! “I wasn't going to do one of them little chintzy, kind of shy, too many people here. I was fixing to kiss my wife. And that's what I did. I kissed her,” he said laughing. It was more than a peck. “And then he kissed me. And then he kissed me from one side to the other side,” Lucinda added. This went on for about a minute and a half. “And don't get it twisted, the woman was kissing back,” Murphy said laughing. “This was not a one-sided affair.” It does take two. “It takes two,” he said. “At one point, I felt her hand on the back of my head and I said, oh, it's on now.” They looked at each other and laughed. The newlyweds got lost in the moment. “It just was that good Jerry. That's all there is,” he said. “What else do you want me to say? The kiss was just that good.” The laughter continued.